The day starts out as an ordinary market day for Enna Summerlark and her father, but it quickly turns into something quite different and Enna’s life is forever changed. 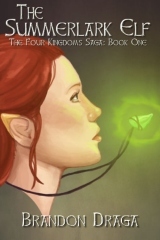 The Summerlark Elf is an exciting story set in a world filled with action and intrigue. The world is well constructed and very believable. I really liked Enna and she is a worthy main character, with strengths that surprise her at times. She learns a lot in a very short period of time which means that she has to re-define her reality, her life, her entire world. She does this with a wonderful strength, adapting to the new situation. The supporting characters are well-drawn as well, and several of them lend assistance to Enna. The plot has a number of twists and turns as the tension grows. There are a number of characters who are very scary, and they definitely add to the suspense. I would have given this book a significantly higher rating if it were not for some rather glaring grammatical errors. The author needs to have another round of editing, one that concentrates on such things a pronoun cases. She and I, for instance, are frequently used when they should have read her and me. For example, “a symbol that reminded her of the shackles he had put on she and Erasmus,” just stops the action in its tracks. There are also a few sentences where the author starts with one verb, but then changes his direction, resulting in a sentence with two verbs where only one is required. Since this is the first book in a series, and since the series has great potential, I would really encourage another round of close editing. The Summerlark Elf has a lot going for it and I really enjoyed reading it. The world is engaging and the stage has now been set for further action. This novel ends in a satisfying way, where many of the conflicts have been resolved. But there are also many unresolved matters, and the reader is properly prepared for further adventures. I recommend this novel to fantasy readers, and I look forward to following Enna on her further adventures.